You may have noticed a flurry of news stories on spinal cord injuries recently. Highlighting the exciting rehabilitation possibilities of exoskeletons and providing up-to-date statistics and information on spinal cord injuries are part of Spinal Cord Injury Awareness month in the US. However, if you or a family member have sustained a spinal cord injury you are facing challenges that will extend beyond September and into the foreseeable future. That’s where organizations and programs designed to help people with spinal cord injuries become an invaluable resource. Thankfully, these resources are not limited to south of the border. Here in BC we are extremely lucky to have several topnotch not-for-profits that deal with providing research, resources and outreach to people with spinal cord injuries. One of those organizations is Spinal Cord Injury BC (SCI-BC). SCI-BC provides support to people with spinal cord injuries at every stage of the recovery process from initial injury, through the transition home and beyond to the business of getting back to living your life. Their exemplary programming is one reason why Murphy Battista signed on to become a supporter of SCI-BC’s Peer Support Program. If you, or a loved one, has sustained a spinal cord injury we urge you to take advantage of what SCI-BC has to offer you. You, or a family member, can check out SCI-BC’s services for the newly injured, plus Peer matches and events. Ready to re-engage with your community and get back out there? Participate in an event: Contact your local Peer Coordinator or browse their Events Calendar to see if anything appeals to you. Become a member and receive The Spin magazine for free or just subscribe to the magazine (it’s free!). The Fall issue of The Spin is now available online. Curious about what an accessible kitchen costs? Wondering how a patient becomes a physiotherapist? Given the hype, what’s SCI BC’s verdict on today’s exoskeletons? Read all about it. More recently SCI-BC has launched SCI-BC TV, a dynamic YouTube based show. SCI-BC TV explores and celebrates innovative stories from the spinal cord injury community. Host Kirsten Sharp keeps viewers informed, engaged, and up-to-date with the latest in SCI, from adaptive sports and recreation, to community events and research. Through its mini documentary/community news format SCI BC TV motivates others to realize their potential, remove perceived barriers and open their minds to new experiences and information. By surprising and educating the public, the show attempts to eliminate stereotypes and common misconceptions. Episodes cover informative, edgy topics, integrated with humour and a human connection. Kirsten has already learned the ins and outs of wheelchair rugby, used her wheelchair to “drop in” at the local skate park, and even walked again for the first time in 23 years with the help of an exoskeleton. Take a look and subscribe for future updates. Last, but not least, if you are based at GF Strong here in Vancouver you (and your family or loved ones) can take advantage of the free services of the Personal Injury Resource Centre (PIRC). The PIRC is sponsored by our firm and staffed by two people who have been through the recovery process after sustaining a spinal cord injury. 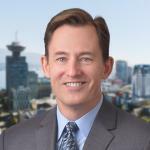 Located adjacent to GF Strong at 908 West King Edward Avenue in Vancouver, the PIRC acts as a clearing house for information and connects people with the resources they need to move forward in the recovery process. Designed as a drop-in centre, the PIRC hosts group meetings and regular seminars on topics of interest to people with spinal cord injuries as well as free legal information clinics. 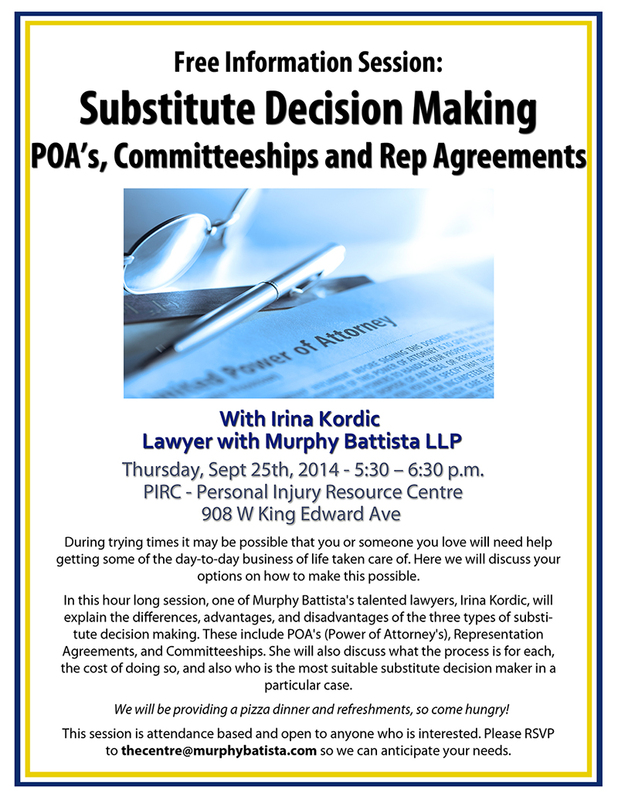 Join Murphy Battista lawyer Irina Kordic at the PIRC on September 25th for a free information session on substitute decision making aka powers of attorney, committeeships and representation agreements. Details are below.